NEWARK, N.J. - March 16, 2018 - PRLog -- The undead-but-not-forgotten La Commedia del Sangue: Vampyr Theatre rises from a shallow grave on March 30, 2018, with creator Tony Sokol and a new cast of immortals. Sokol presides over the ceremony, mixing his distinct nihilism with fresh insights on the connection between the modern vampire mythos and the old Gods. The ritual promises a heady mixture of audience participation, sanguine shenanigans, a touch of magic, and collateral damage for all those in attendance. Mortals will taste darker pleasures than the usual vampire themed dance party with fake fangs and carbonated True Blood. Sokol plans to "upend the vampire community with this subversive send-up of the very rituals that they claim to hold dear." Sokol consulted with the Kali Mandir in Laguna Beach, CA to alleviate offense to Kali, proven to be destructive when disrespected. We get the feeling real vampire magickal rituals can, in fact, be dangerous. Sokol performed his first vampire rituals in 1988. Anne Rice's Interview with a Vampire was published a over a decade before, Hammer Horror's Vampire Circus hit cinemas in 1971. He brought Vampyr Theatre (https://deyliveaccestv.wordpress.com/2015/04/14/la-commed...) to the stage in 1992, offering live performances "for vampires by vampires" usually seen on a screen. Plasma pictures continue today, as Living Among Us, the last film starring John Hurd, started the year with a blood red carpet event featuring notorious vampire community nobility Emperor Don Henrie and LA's Vampire Queen, Maria Mors; The X-Files is portraying surgical blood rituals (http://www.denofgeek.com/us/tv/the-x-files/271723/discuss...) and the much anticipated Vampire Chronicles TV Series is even now being adapted by Rice's son Christopher for Paramount TV. 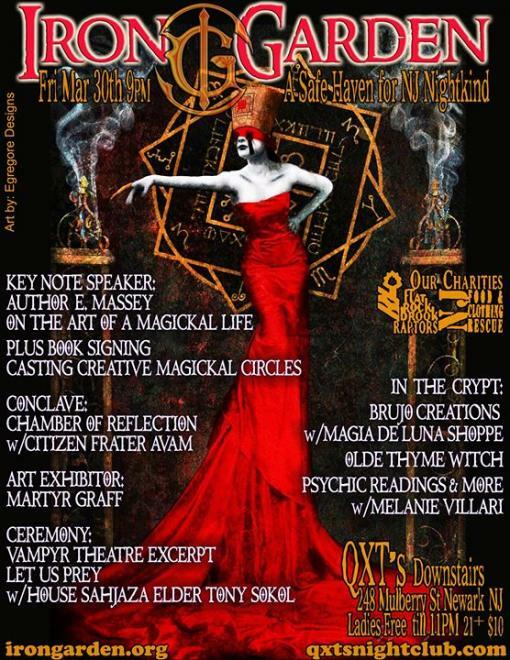 The Iron Garden March Gathering is produced by high priestess Madame X, matriarch of House of Dreaming. Author Eddie Massey will be keynote speaker. The event happens Friday, March 30, 2018, at 9 p.m. at QXT's Downstairs, 248 Mulberry Street, Newark, N.J. The Iron Garden March Gathering costs $10 at the door for men. Women get in free until 11 p.m.